Allow me to introduce myself. My name is Yvon Gobeil. I was a commercial fisherman for 42 years, and my work made me very happy. The commercial fishing season would start in the spring, around April, as soon as the ice melted. That's when we would set up our nets. We'd visit our nets early in the morning, then we'd bring the fish home. My wife and kids would prepare the fish. From time to time, I would go move my hoop nets. A day of fishing would be very, very long. I would work 12 to 15 hours a day. It always depended on how many fish we would catch. Some days were great, but others were less good. Fishing season ran from April until the water would freeze up again in the fall, in November or December. It depended on the weather, on how warm it was. We would take up our nets when the ice came. This is my fish shop, where I would prepare the fish. We had wholesalers who would come by twice a week to pick up our fish. We also had retail sales. My clients would mostly come by my house. But I also did deliveries for ten years. When we started fishing commercially, we had a rowboat. There was a sort of latch in the front with a hole in it, where you could mount a sail. When the wind was good, we would mount our sail. If the wind wasn't good, we would row. It would take three, four, five hours to get out there. Later, we modernized. We got motors, 15 horsepower. Now, we have 90 horsepower motors. Things have changed. I lost my parents when I was young. I was only 13 years old, I stayed with a commercial fisherman for three years. That's when I started to get interested in commercial fishing. I would go fishing with them. I haven't always only been a fisherman. I navigated. I worked all over the place, in Montreal and other places. I started to fish when I was 18. I retired when I was 60. I had to stop. I had suffered three heart attacks. Otherwise, I would not have stopped. I would not have stopped. I would've kept fishing. I miss fishing. I miss it quite a bit. This is a hoop net. It's a device used to catch all sorts of freshwater fish: bullhead, turbot, bass, perch. The net is stretched out like a funnel. It has a lead net to guide fish in. Once the fish have gotten to this point, in the third section, they can't get back out. They come in from the back of the net, behind the two wings, and go towards the front. Then they can't get back out. We stretch out our lead net, which is a wall of netting 60 feet long that funnels fish towards the centre here. You can put out three or four of them in a row, depending on how deep the water is. You adjust to the depth of the water. The fish are guided into the net there, and when they reach the third section, they can't get back out. This system is called a hoop net. Modern hoop nets are made out of nylon, with aluminium and steel hoops. They're good. They can last 25, 30 years without any problems. You don't need to put tar on them. They last a long time. When I started fishing, our nets were made of cotton. You had to apply tar at least three times a year. The hoops were made of elm. We would cut down small elm trees and make our on hoops. When I started, we had to weave our own nets. We had needles and moulds for the size of mesh we wanted: an inch, 7/8, and so on. We picked our mesh size and wove all of our nets. All winter we would work on repairing our hoop nets. You had to take care of cotton nets on a regular basis or they would rot. You had to tar them over and over again. The good thing about modern nets is that they last a long time. 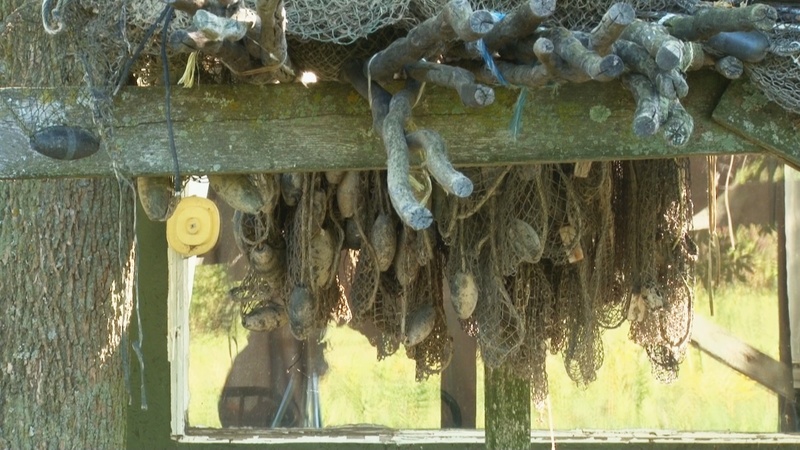 Even the floats on the old nets were made out of wood. These floats on the wings of the net were all made of cedar wood. We would staple these floats along the netting. We would start fishing for Yellow Perch in the early spring. As soon as the ice cleared we would fish for Yellow Perch. Later in the season, we would fish for Bullhead. In mid-May, we would fish for eels. That would continue until September or October. We would catch eels. This is a gillnet for catching sturgeon in Lake Saint-Pierre. This gillnet has 8-inch mesh when it's stretched out, and it catches fairly large sturgeon, because smaller sturgeon are protected. There are weights on the bottom and floats at the top. This net opens out to six or seven feet high. First we would dry out the fish—sturgeon, turbot, all kinds of fish. We would put it on a drying rack, salt it, and leave it there all night. The next morning, we would bring it here. We would place the fish on smoker racks, always with the skin facing down so that the flesh would not blackened. Then we would smoke it. Smoking times depended on how thick the fish was. If it was thicker, we would leave it there longer. If it was not so thick, then it would take less time. It would generally take two or three hours. I built this smoker myself with one of my brothers-in-law.